uuid : e565ef26-dbe0-4221-a100-35a72b0c5af7 templates_id: 119462 templates_uuid: "fe0f9ea9-d8d9-422f-a0c2-ccce3085f825" title: "Purchase Order Template - Create a Purchase Order Online" display_name: "Purchase order" meta_keywords: "PO" description: "
Whether you\'re a purchaser or seller, you\'ll need this purchase order template when buying, ordering or providing goods and services. In addition to the existing terms and conditions, this purchase order template will act as a formal offer for the supply of goods and/or services in return for payment. This purchase order covers the description of what is to be bought or sold, the contact details of the buyer and seller, as well as the price and payment details. This purchase order will calculate the sub total, discount, vat and purchase total automatically for you. A purchase order (sometimes called a work order) confirms an order of goods or services by a purchasing company (the client) from the provider (supplier). It sets out types and quantities of goods purchased, specifies any services requested, and includes the details of agreed costs. Purchase orders are used by many businesses as part of their standard purchasing processes to clarify terms of transactions, prior to services being carried out or goods being delivered by the supplier. A purchase order forms part of the overall contract, explicitly stating what has been requested by the client or purchaser and setting out additional terms. It helps the buyer by ensuring that all costs are specified in advance, and it also serves as proof to the seller of what has been ordered. As such, it can be used by both businesses during a transaction. As well as serving as proof of intentions, purchase orders can also improve the streamlining of purchasing processes and help ensure that accurate records are kept for accounting and auditing purposes. What should be included in a purchase order? How does a purchase order differ from an invoice? A purchase order requests the provision of specific goods or services; the invoice requests payment for the supply of these goods or services. Purchase orders should always precede invoices. A purchase order may be used as the basis of an invoice, and invoices should always reflect the details contained in a purchase order (in particular the agreed fees/amounts). Many purchasers require the relevant purchase order number to be included in any invoice in order to streamline their processing and ensure that everything tallies up. What is an appropriate payment period? 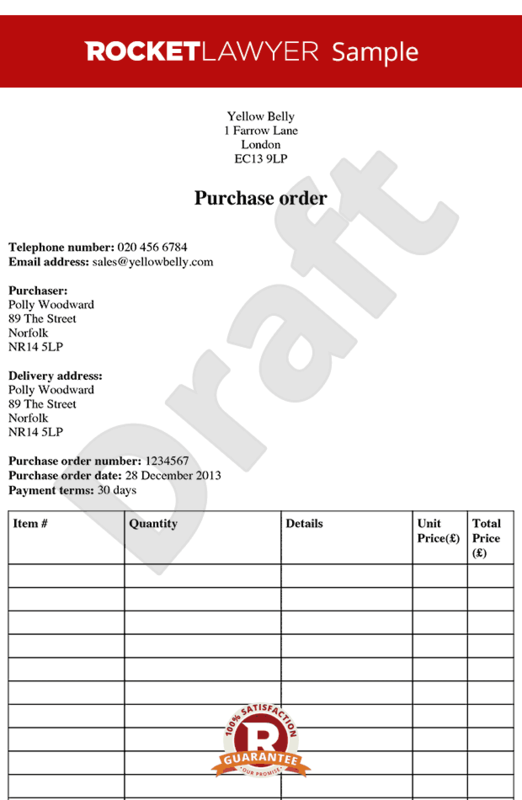 A purchase order can include a note of any payment period, if agreed, or a preferred payment period if one was not discussed (although this may not be binding). The standard payment period is within 30 calendar days of receipt of invoice, beyond which the payment is considered late (unless otherwise agreed) and a statutory demand can be made. If you only deal with a handful of contractors and prefer to keep things informal, you might choose to omit purchase orders from your transactions. However, some contractors will demand a purchase order before starting work. Also, having a formal contracting system in place, which includes purchase orders, can help to prove the status of contractors - so they are not classified as employees for purposes of IR35. This purchase order does not automatically select which relevant law (e.g. English law) which applies to the order. If the goods and services are based in England and Wales, the law of England and Wales will apply.
" created_timestamp: "2018-10-08 04:36:07.0" modified_timestamp: "2018-10-08 04:36:07.0" active: true created_by: 157 modified_by: 157 dcm_id: 280 url_slug: "Purchase-order-template" meta_description: "Prepare a purchase order template with step-by-step guidance from Rocket Lawyer. As a buyer or seller you\'ll need this document for the sale and purchase of goods or services. Try this purchase order for free.." time_to_complete: "10 minutes"
Whether you're a purchaser or seller, you'll need this purchase order template when buying, ordering or providing goods and services. In addition to the existing terms and conditions, this purchase order template will act as a formal offer for the supply of goods and/or services in return for payment. This purchase order covers the description of what is to be bought or sold, the contact details of the buyer and seller, as well as the price and payment details. This purchase order will calculate the sub total, discount, vat and purchase total automatically for you. More than just a Purchase order template, our step-by-step interview and guidance makes it easy to create your document. Easily create online, download, print and sign your free Purchase order in minutes. This document is also sometimes called: PO.